Ads are a foolproof way to gather lots of Instagram impressions on your Instagram posts. Not only do they guarantee impressions, but your post is shown to your perfect target audience. It’s also great that you also get to choose your own budget. Impressions can turn into likes, comments, follows, and sometimes purchases. That’s why it is important for business profiles to gather as many impressions as they can. Does your Instagram profile need some help? 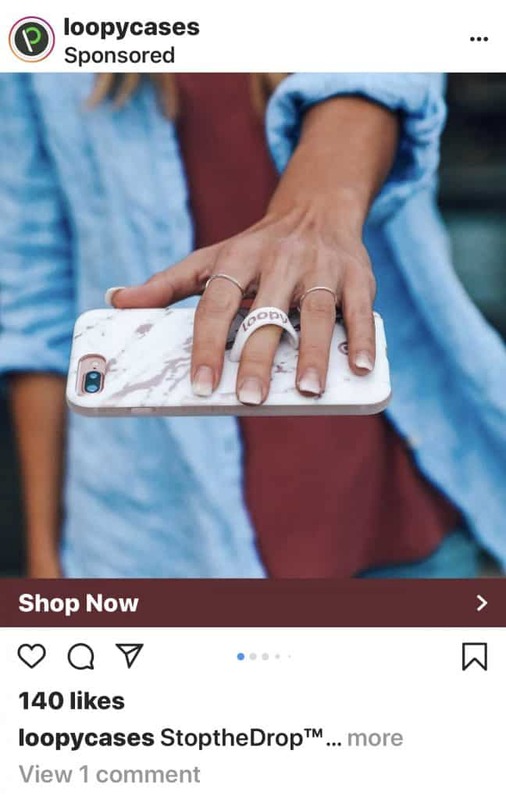 If you’ve never tried out Instagram Ads before, keep reading to learn how and why it is the best way to gain more Instagram impressions. Remember, you must have a business profile to track your impressions and run ads. To learn how to make a business profile, read this article: Why You Should Switch To An Instagram Business Profile . Have you ever wondered what Instagram impressions are and why they are so important? Every time you look at an ad or post on Instagram, that counts as one impression. Impressions are important because that is how you get new followers and increased likes. Impressions don’t always turn into likes or comments, but they sure do help. A sure way to increase impressions dramatically on one of your posts is by using Instagram ads. Using Instagram ads is a common practice for business profiles because it works so well. The increased impressions is a necessary starting point to grow any online business. Without impressions, you won’t get any user engagement! 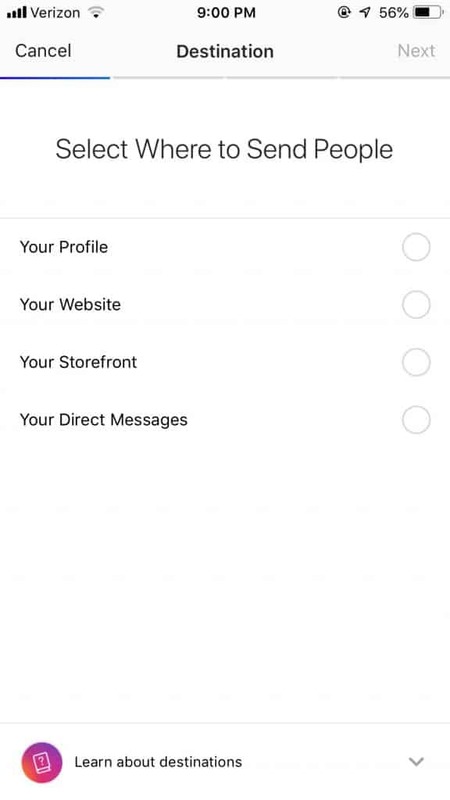 On the Instagram app, go to Menu and click Insights. Next, scroll to the bottom of the page and you’ll find a row that says impressions. Note that you can track daily impressions on the insights page. Also, you can see if your impressions have increased or decreased from the week before. Once you know where to find your Instagram impressions, then you can start tracking them and watch them grow with Instagram ads! It’s likely that you’ve seen an ad while scrolling through Instagram. 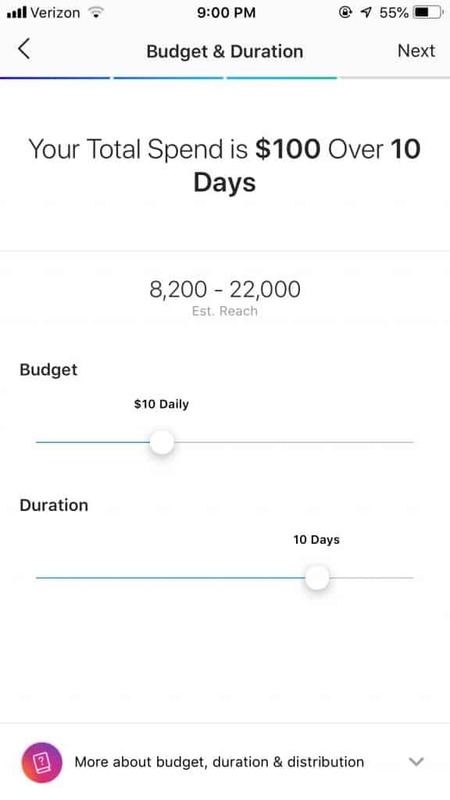 Instagram ads look like your ordinary post, but they have a few differences from regular posts. The biggest difference on an ad is the big “Shop Now” button that isn’t on ordinary posts. This allows viewers to go directly to the advertiser’s website. You might see adds that are oddly very relatable in your life because every ad is sent out to a specific target audience. Some ads might be specific to location, age, gender and more. So if you’re starting an ad, you don’t have to worry about finding the right target audience. Instagram will do it for you! Some reasons why business start ads is to increase brand exposure or to generate more traffic to their website. 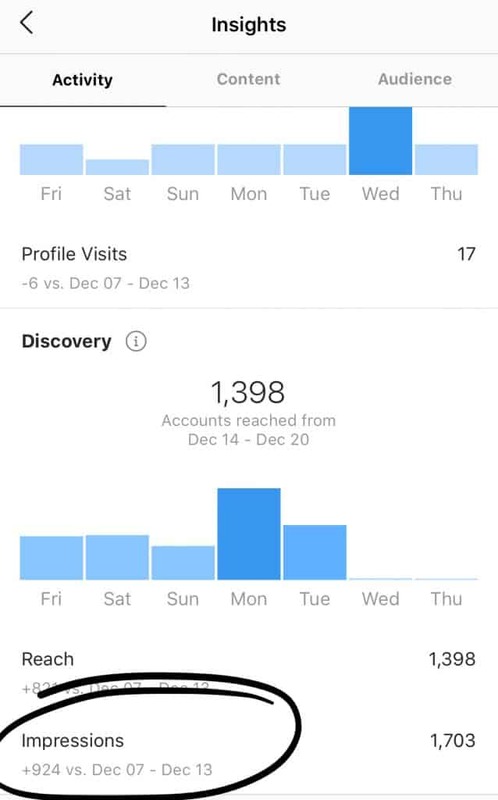 If you have a business profile and want to gain iInstagram impressions and viewership to your business, you can start an ad too! Also, Instagram ads are extremely effective. In fact, according to a survey done by Instagram, 60% of people said that they discover new products through ads on Instagram. Setting up an Instagram ad is fairly easy. As long as you have a business profile and a budget set aside, you can start an ad. Yes, you heard that right. A budget. Advertising on Instagram does cost money, but payback from your ad could make it worthwhile in the end by getting increased Instagram impressions. First, Select the post you want to advertise. It’s recommended to choose a post that is selling or promoting a product or service. Really anything that you want to bring attention to will work. Next, tap promote, which can be found under any of your posts. Then, select where to send people. Think about if you want to send viewers to your profile, website, storefront, or direct messages. Next, select target audience. Choosing ‘Automatic’ is a good idea for starters. 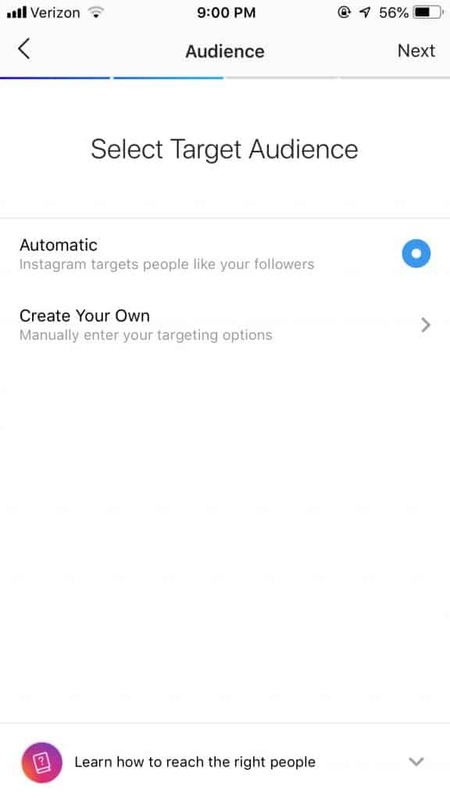 As mentioned before, Instagram will target people similar to your existing followers. Lastly, choose your budget. You can choose to spend as little as one dollar for one day, or $1,000 daily for thirty days. Whatever your budget is, you can select it here.You can also view the estimated impressions that your budget will bring. Tap “next” to confirm your payment info, and you’re ready to go! After setting up your promotion, it will only take a few minutes for Instagram to approve it. Once it’s approved, watch the increased impressions come in! As a general rule of thumb, the more money you spend, the more impressions your post will get. Impressions will rise over time. Don’t expect to see all of your number rise at once. Over the course of the promotion, you might gradually see your account gain followers and likes on your promoted post. Your promotion is working! Ads will give you tons of exposure. Remember when Instagram stopped showing posts in chronological order? Since posts are no longer listed in time order, it is all the more important to make sure you post is seen. An ad will ensure that the right audience sees your post. Remember to add a call to action. The caption of your promoted post is very important too! Make sure your caption has some sort of direction as to what you want your viewers to do next. It might be something like, “check out my website to see more items like this,” or something along those lines. It might even be as simple as liking commenting or sharing the post. By telling your viewers what to do, then they are more likely to do it! 💡 Related Post: What kind of Instagram advertising is best for you? If you want to start a promotion but do not know where to start, first look at your insights. When looking at your insights, go to the “content tab” and find “feed posts.” Here, you will see your posts ordered by engagement. This is a great way to compare which posts are getting more impressions than others. If you see a post that has less engagement that you’d like, that might be a good post to promote! However, don’t promote just any post. Make sure you have a clear reason of why you want to promote that specific post. Maybe its something you’re selling on your online website, or you just want to promote your business. Yes, the only con of Instagram ads is that it costs money. However, you get to choose exactly how much you want to spend. For example, if you only want to spend $15, you can rest assured that you will not be charged any more than $15. Also, with the money you spend on ads, its guarantees impressions. The amount of likes and follows you get may vary, but its a good thing to try out for your business profile. 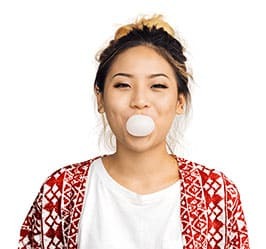 If you have an Instagram business profile, why not try out Instagram ads to gain more impressions? Now that you know all about ads and impressions, give it a try! My name is Kim Hanna. I am a college student at Monmouth University. Writing has always been a passion of mine. I like writing about current trends that have to do with social media and fashion. Tried Upleap yet? We help thousands of Instagrammers grow with a dedicated account manager. 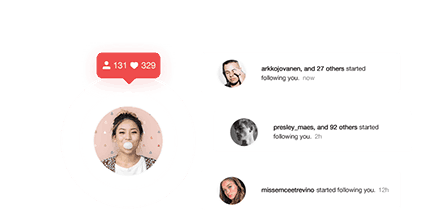 Get More Instagram Followers With Upleap. Try Us For Free NOW! Upleap helps Instagrammers from all over the world grow their reach, likes, and followers. With a dedicated account manager, you'll be saving hours a day with Upleap!